Every spring, cherry blossoms return to the Union Square Farmer's Market, the Boys of Summer put their mitts back on and toss a ball again, my son's school has their annual concert night, and Festool releases new tools. Part of the beauty and efficiency of the Festool system is that all the the tools come in standardized, stackable boxes called "Systainers". Systainers lock together in stacks and last year a new style of Systainer made it possible to access Systainers in the middle of a stack without unbolting the whole stack. This year we see the introduction of three new accessories that make the Systainer system more productive than ever. First up is a re-engineered Sys-Cart. You have always been able to bolt a stack of systainers on top of any of the Festool Vacs, but if you have a lot of tools, or extra storage systainer, the extra set of wheels is pretty useful. The old Sys-Cart was pretty popular, the new one is stronger, takes more weight, and has a more positive locking mechanism for Systainer than before. The wheels are well made, and lock if needed. loaded carts. We have all the new tools in the showroom and the Sys-Roll is generating a LOT of enthusiasm. The third new expansion on the Systainer line is a new Toolbox. Basically a 6" deep Systainer bottom with a handle it can easily bolt on top of your stack of systainers as a catchall for all the miscellaneous tools you don't know where to put. My initial reaction to the toolbox was pretty ho-hum, but in the showroom, it's met with some customer enthusiasm. Both the Sys-Roll and the Toolbox are priced pretty aggressively by Festool, and I think people are both surprised at how inexpensive they are (compared to other Festool Stuff) and the productivity gain is pretty obvious for everyone to understand. Finally the flagship of the new releases is an upgrade to the TS55 REQ. The new version is just as superb as the old model with some interesting tweaks. You can now cut to within a 1/2" of a wall. The depth adjuster is now in both Metric and English (about bloody time too!) and has a micro-adjust feature. The micro-adjust feature is interesting because it give you the option of cutting to a precise depth, a feature you don't need often but when you do it's a lifesaver. There are a bunch of other tweaks but the only other major one that comes to mind is that the outer splinter guard don't have to be removed for angled cuts. You can read about the machine and also view a video here. 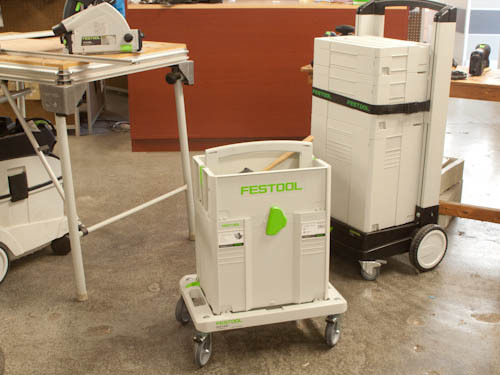 All the new Festool stuff will ship from our warehouse or you can pick it up on May 1, 2013. Not before. But you can pre-order anytime. As always there is free shipping on all Festool orders over $50 to anywhere in the continental US, and of course free returns for anything you don't like ( URLhttp://www.toolsforworkingwood.com/store/more/festool_freeship.html, restrictions apply).